For those who enter diets or instate lifestyle changes, the restrictions we face can be depressing. We think about all our favorite foods we have to give up, and resign ourselves to either boring meals or having to become full-time personal chefs to ourselves. Even harmless-seeming condiments like our favorite salad dressing and sweetener in our coffee can become off-limits. I know a lot of people who decide to go on a diet and just microwave a bowl of chicken and broccoli for every meal until they fall off the wagon. And there's something to be said for the effectiveness of repeating the same meals over and over. But you don't have to live off of bland, dry food. You might have said good-bye to creaminess, sweetness, coconutty deliciousness and peanut-buttery goodness. Probably you are cutting out greasy or cheese-drenched comfort food, or, like my parents (and me to a less strict extent), oils altogether (see The Esselstyn diet and my family). But there are still plenty of "flavors" you can enjoy that won't put you off your diet. Of course, every diet is different, and your restrictions will vary. But over the years of many methods of eating, these are some flavors (spices, condiments, whatever) that seem to be relatively "safe" for most diets. I'm not going to go down the spice rack and list every bottle, but here are the more over-arching tastes that you can achieve without a lot of caloric sacrifice. If you like spicy food, you're in luck. A little bit of hot sauce or jalapeno can add an enormous amount of flavor for almost no calories. And the best thing is the options for where you get your heat are boundless. Cayenne, Tabasco, sweet chili paste, sriracha, or even regular black pepper of salt-and-pepper fame all have different tastes and uses. Plus, there are even studies that show spicy food might boost your metabolism. If you don't like spicy food, you might try sneaking in just a tiny bit of heat. It's something you have to get used to, but once you do, it's a slippery slope! Drawbacks: Could be bad for people with heartburn/reflux problems. Soy sauce adds an Asian mood to anything on your plate. Unfortunately it has a lot of sodium, which is a no-no for many dieters. But there are several options that give you the taste with a lighter salt load. 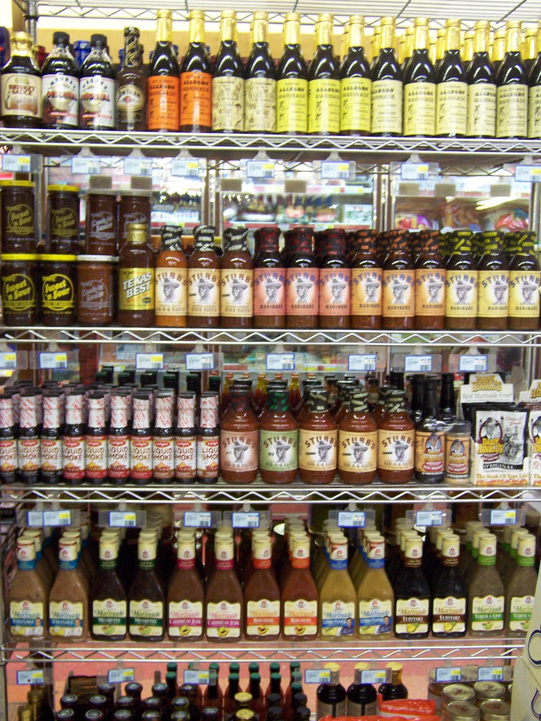 Low-sodium soy sauce is good, as is low-sodium tamari. You could also try an alternative such as Bragg's Liquid Aminos. Depending on sugar, teryaki might be OK, too. Mmmm. Drawbacks: Most of us are supposed to cut back on sodium, and even low-sodium versions are probably more salt than we should be having. I would not touch it a few days before a photo shoot or other event where you want to look thin. Salt is bloating. You love pizza and pasta? Me too. But it's probably not just the carb-load and fatty cheese you crave. You're free to have as much tomato as you want. That means pizza sauce and pasta sauce are in, as well as ketchup and (depending on sugar) barbeque sauce. You don't need a high-calorie bed to pour them on. I love veggies and beans in bbq sauce, and tomato sauce on my vegan meatballs! Drawbacks: Like spices, should be OK for almost everyone unless you have a low tolerance for acidic foods. Oil and vinegar might have too much fat, but vinegar by itself can do more than enough! Throwing a little vinegar on your stir-fry or in your sauce can give you that sour taste that makes any vegetable interesting. Sauerkraut is a great topping or side for a veggie brat, or even on a salad if you don't have any "safe" dressings handy. Drawbacks: I seem to remember Fit for Life having a "vinegar is a cleaning product, not a food" policy. So some "internal hygiene" diets might say no. For most of us it should be fine. Here's a recipe for making guacamole out of edamame instead of (high-fat) avocados. Add some lemon or lime juice and cilantro and it's almost like the real thing. I like fresh-squeezed lime juice on my corn on the cob instead of butter. Even if you are on a low-sugar diet where fruit is a no-no, lemons and limes don't really have the sugar that other fruits have. Drawbacks: Why are all the good lemon squeezer devices like $15? Rip off! If coffee was caloric, no one in this country would ever diet. It's a way of life for Americans. As an add-on flavor, it tends to be more of a dessert thing, and most diets aren't very dessert-friendly. But if you find a way to slip it in, whether it's in a smoothie or in a low-sugar muffin, it's a healthier option than chocolate or peanut butter. Drawbacks: Lots of people go off caffeine for health reasons, weight-focused or not. Cinnamon is sort of the "spicy" option of dessert foods, in that it adds a zing and may increase metabolism. It can be a great substitute for sweeter in pastries or coffee. There are a lot of sweetener options out there that may or may not be healthy, depending on who you ask and what diet you're on, but for most of us it's better if we can cut back on them altogether. There's still an adjustment as you slowly lose your sweet tooth, but if you replace your sugar shaker with a cinnamon shaker you'll be much better off. Drawbacks: Can't think of any. So that's a very general survey, but those are the major "flavors" I've found that make a huge difference without detriment to my health or diet. The fun part comes when you combine them. Hot and sour soup! Lime salsa! Cinnamon latte! Bon appetite, and feel free to add your own favorite flavors below!